Lifting free-weight dumbbells is an incredibly effective and efficient way to work the major muscles of your body. The lower body workout I teach at my Transformation Center is all done with dumbbells. The exercises which make up this routine blast the quadriceps, hamstrings, glutes, and calves. When we use the proper form it also strengthens the core, improves flexibility and builds stabilizer muscles which support the knees, ankles, and hips. This lower body workout includes three variations of squats — it is absolutely the best exercise for lower body work and it also is incredibly good for calorie burning and cardiovascular health improvements. This workout is the exact approach that I have followed to rebuild my leg muscles after a brutal injury I suffered a few years ago. This workout works and it’s simple (not easy) to do. I used this Lower Body Workout to rebuild my leg muscles, at age 50, after an injury which ruptured the quadriceps tendons on both legs. 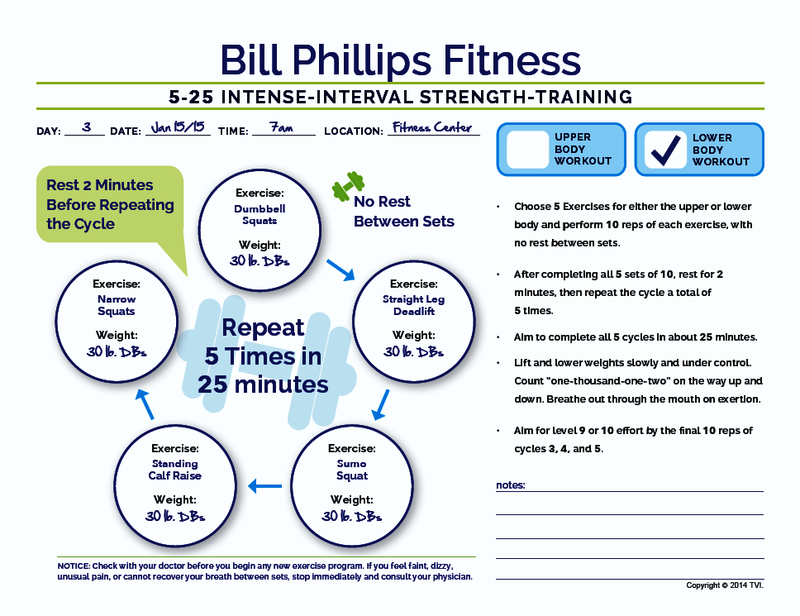 With this ‘5-25 Intense Interval Strength Training’ workout I can stick with the same weight for all 5 sets (as opposed to ‘pyramiding’ or increasing weight for each set as we did with Body-for-LIFE). The way 5-25 is designed we reach ‘progressive resistance overload’ (needed for positive muscle adaptations) through fatiguing the muscles more with each set. By your 5th set of 10 reps for each muscle group your muscles will be thoroughly cooked, and that is good! 1. Dumbbell Squats — 10 Reps 2. Straight-Leg Deadlift — 10 Reps 3. Dumbbell Sumo Squats — 10 Reps 4. Standing Dumbbell Calf Raises — 10 Reps 5. Narrow Stance Dumbbell Front Squat — 10 Reps Complete all 5 exercises, 10 reps of each, with no rest between. After you’ve completed all 5 exercises, rest 2 minutes and then repeat the cycle. Aim for the completion of 5 times through the cycle in approximately 25 minutes. ++This workout can be done with a number of different exercise combinations. For example: 10 reps of barbell squats, followed by 10 reps on the leg extension machine, 10 reps of leg curls, 10 seated calf raises, and 10 reps on the leg press machine. There are many different combinations we can put together to get an excellent high intensity strength training workout for the lower body. ++Never sacrifice good form to lift more weight. Doing the exercises with proper form and lifting the weights slowly and under control is even more important for those of us over 40. 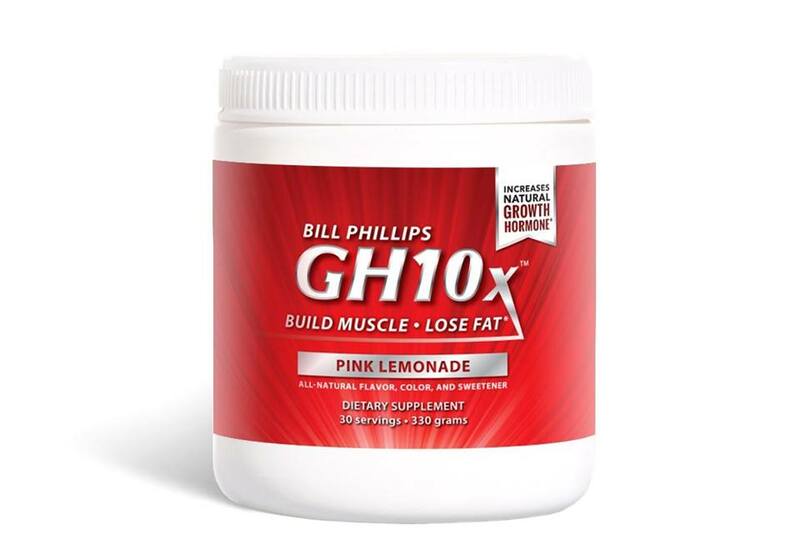 The great results from working out consistently come over time. Injuries are setbacks that throw us off track. Good form is one of the keys to keeping your exercise program going and producing great results. Starting Position: Hold two dumbbells at your sides, with your palms facing in. Stand with your feet shoulder width apart. The Exercise: While keeping your chin up, bend your legs at the knees and lower your hips until your thighs are parallel with the floor. Then, pushing from your heels, lift yourself back up to the starting position. Breathe out on exertion. Take your time — go lower and slower to fully work the leg muscles. Starting Position: Stand up straight, with your feet shoulder width apart and a dumbbell in each hand, your palms facing towards the front of your legs. This is a terrific exercise for the hamstrings, and it helps strengthen the lower back. The Exercise: Bend forward at your hips, and slowly lower the dumbbells in front of you, keeping the weights very close to your legs, until the weights almost tough the floor. Then, while concentrating on the muscles in the back of your legs, raise your upper body and the weights to the starting position. Roll your shoulders back, keep your chin up, take a deep breath and then repeat the exercise. Starting Position: Hold a single dumbbell or ‘kettle bell’ in front of you. Your feet should be pointed out diagonally at about a 45 degree angle. Stand with your feet double shoulder width apart. The Exercise: While keeping your shoulders, back, and head upright, bend your legs at the knees and lower your hips until your thighs are parallel with the floor. Then, pushing from your heels, lift yourself back up to the starting position. Keep your back as straight as possible throughout this exercise. Starting Position: Start by holding a dumbbell in each hand, with your palms facing the sides of your hips. Stand with your feet half shoulder width apart. Keep your feet parallel with each other. The Exercise: Keeping your legs straight, raise up on the ball of your feet. When you get to the top hold it for a count of one, then slowly lower to the starting position. Starting Position: Hold two dumbbells at your sides, with your palms facing in. Stand with your feet half shoulder width apart. The narrow stance will make the quadriceps muscle groups work even harder than regular squats. The Exercise: While keeping your shoulders, back, and head upright, bend your legs at the knees and lower your hips until your thighs are parallel with the floor. Then, pushing from your heels, lift yourself back up to the starting position. Keep your back as straight as possible throughout this exercise. Breathe out on exertion. The 25-Minute Workout Which Burns Fat for 40 Hours! 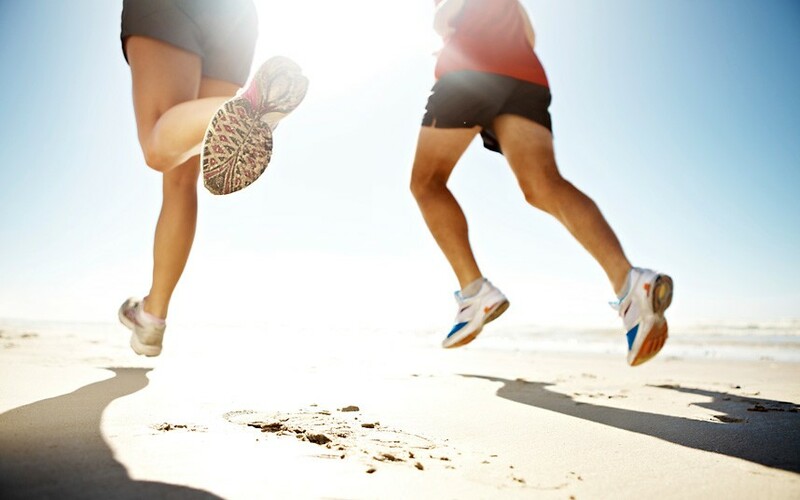 Why Does High-Intensity-Interval-Training work so much better than old-fashioned cardio? Forget about how many calories the cardio machines tell you that you are burning from your workout. The real measure of the exercise benefit is in how many calories your body burns AFTER the training is done! 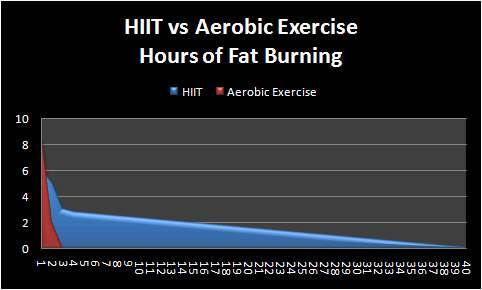 In this chart, you see the results of a scientific study which measured the energy expenditure (calorie burning) during and after a HIIT workout vs. a regular effort workout (like jogging at a steady pace). HIIT causes your body to burn more calories for 40 Hours After your workout. HIIT has been shown to help people lose twice as much bodyfat over 6 weeks of training (twice as much as people who did longer but average intensity workouts). HIIT is the BEST workout method for burning fat and also for improving heart health… and c’mon… EVERYONE can make time for 5-25 HIIT workouts! !